Internet is out and won’t be fixed until tomorriw. Was drawing strip planning to use phone to upload, only to remember to late that I can’t email it to myself and iPhones can’t drag-drop onto them directly. So… sorry, gotta wait for repairs. I used to have a sweet tooth before I gave up soda, now I lean more towards full-flavored zesty-spicy things,. If it had a few more colors. Amanda! What did you do?!! Well see, Amanda drank an entire glass of pink sparkles. She does what she wants to do. And then she started sneezing all over the place and now we have that. Because her body does what it wants to do. Can’t you use your phone as a personal hotspot for your wifi antenna on the computer? I’ve seen that guy before in Order of the Stick! Must be a crossover. Think we’ll find out the Sarnothi are having issues with an evil lich? I’d rather see the Flumph. Or you can plug it in on a Mac or PC and transfer using iTunes. You won’t fool me, I know this is the new character, Pink Scribble Amoeba! A member of a sentient race that lives in symbiosis with the Sarnothi and helps them throw all the best parties. Props to Theo for pointing out in-story what commenters were concerned about. I think something good will eventually come from this parent-child talk…because Amanda’s attitude does need to be carefully dealt with. Seriously, Grandpa Theo is my new current hero. He and Mari are really hitting it out of the park. Well, this ain’t their first rodeo. 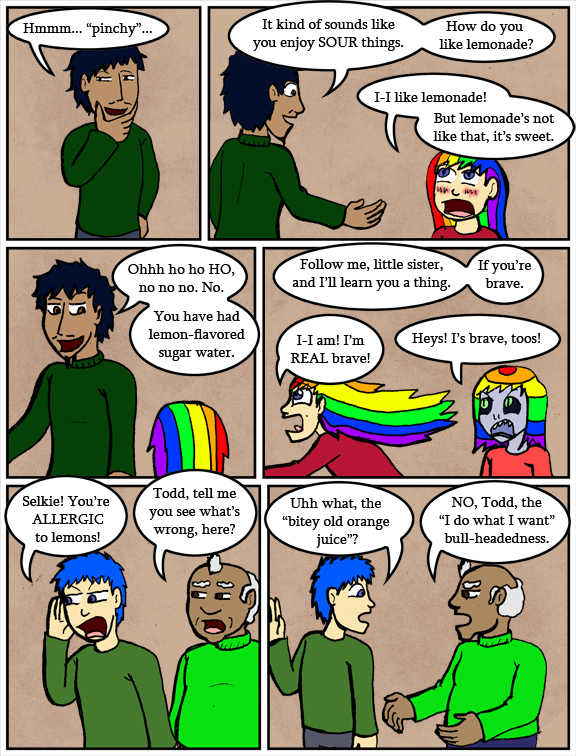 We already know Todd isn’t the most observant one at times when it comes to others, although so far pretty much all grownups in charge of kids gets gold stars from me – way better than most of the RL adults I was around. But Theo has shown to be very perceptive to those around him, and also filled with *great* father advice. Yeah, Amanda has it bad. And that’s a good thing to help her transform into a better person. She needs to want to change, and this is a great way for that to happen. Good thing Theo’s pointing this out. He’s been pretty good at this kinda stuff. Agreed. He may not pick up on the clues, but once he’s seen the problem he’ll see what he can do to remedy it. He knew Selkie was being bullied by Amanda before the revelation about her being his daughter and did nothing. I’m also curious what happened with the talk he and Andi were supposed to have about Amanda’s behavior, that either hasn’t happened or happened almost entirely off screen. Hah! Love the super-sour lemonade. It reminds me of my childhood. My sisters and I used to play ‘Cowboy Saloon’ complete with drinking contests. The hero drank shots of cream soda or root beer while the villain drank shots of straight lemon (or lime) juice to prove how tough she was. “I do what I want Bullheadedness? It’s almost as if modern permissive parenting combined with overzealous but toothless discipline hasn’t done her any favors. I think reality just hit. Funny you mention toothless since I just got a tooth pulled. 3 hours of pain. I know you guys don’t need to know this, but I am completely loopy I am surprised I am typing so well though it’s probably jhshdhdkhf. Drugs and pain give me bad life choices right now. You realize that she hasn’t HAD “modern permissive parenting” right? She was with a family that seriously abused her and then in the orphanage for all but the past few months? Like Andi has not had the time to establish a full parenting rhythm yet because seriously she’s still busy convincing Amanda that she is here and will not leave her and is adjusting to life with an eight-year-old child. Todd is not a full custodial parent and has not yet established rules rhythm and system when she’s with him because he’s still adjusting to her presence. And they both know enough about her abuse history to tread carefully with her, especially since Todd has history himself. I suspect what Theo’s about to do is share some of his and Mari’s own tactics from raising Todd, because he recognizes it in a way Todd doesn’t really have the distance to. ColdFusion, could you point to some specific incidents where you saw these two forces at work? I have some idea of what you mean but I am not sure that I am focusing on the correct sources. Finally, someone brings up the rainbow elephant in the room.